Thirty years ago this day, my husband gave me a ring. It was in the style of the then-very-popular 'eternity ring'...but the diamonds -- 10 of them -- went only 1/2-way round the band -- a practical concession to the busy hands of a mother. He'd meant to give it to me on our 10th anniversary, which was in August that year, but the jeweller had called to say it was ready to pick up, and I was very pregnant with our second child, who turned out to be a son. And so...he presented it to me on Mother's Day, 1985. 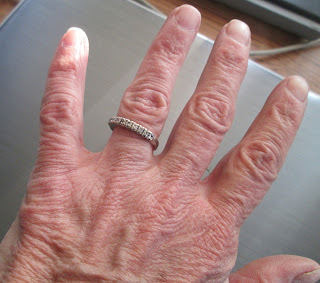 I still wear the ring...though I now wear it on either hand, and usually with another ring as a pair. I now have what I remember as my mother's hands, though with the short, fine bone structure I inherited from my father. Eternity, as far as possible, this side of Heaven. It is a lovely ring....one I am sure your son will treasure one day. I got exact copies of my Dad's hands, only smaller. Happy Mother's Day dear friend. Beautiful story, Margaret. Happy Mother's Day. Lovely story Margaret...the holiday helps to remember the day the ring was presented more easy. Your hands are wonderful, and the use of being mother and wife evident, but a treasure. Margaret, what a lovely story. Lovely memory.